❖ The four rectus muscles: the superior, inferior, medial, and lateral rectus muscles. ❖ The two oblique muscles: the superior and inferior oblique muscles. — Extraocular muscles of the right eye. Figs. 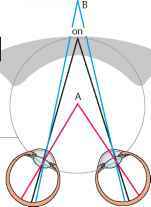 17.1 a and b The two oblique ocular muscles insert on the temporal aspect posterior to the equator. The four rectus muscles insert on the superior, inferior, nasal, and temporal sclera. into the superior, inferior, nasal, and temporal sclera. The oblique muscles insert into the temporal globe posterior to the equator. The insertion of the muscles determines the direction of their pull (see Table 17.1). The connective tissue between the individual ocular muscles is incorporated into the fascial sheath of the eyeball (Tenon's capsule). Other important anatomic structures include the lateral and medial check ligaments comprising the lateral connections of the orbital connective tissue and the ligament of Lockwood. This is comprised of the ligamentous structures between the inferior rectus and inferior oblique that spread out like a hammock to the medial and lateral rectus muscles. These anatomic structures and the uniform nerve supply to the extraocu-lar muscles (like acting muscles have like nerve supply) ensure ocular balance. Changes that disturb this balance, such as ocular muscle paralysis that limits or destroys the affected muscle's ability to contract, cause strabismus. The angle of deviation is a sign of abnormal imbalance. Direction of pull of the extraocular muscles: The horizontal ocular muscles pull the eye in only one direction: The lateral rectus pulls the eye outward (abduction); the medial rectus pulls itinward (adduction). All other extraocular muscles have a secondary direction of pull in addition to the primary one. Depending on the path of the muscle, where it inserts on the globe, and the direction of gaze (Fig. 17.1), these muscles may elevate or depress the eye, adduct or abduct it, or rotate it medially (intorsion) or laterally (extorsion). The primary action of the superior rectus and superior oblique is elevation; the primary action of the inferior rectus and inferior oblique is depression. Table 17.1 shows the primary and secondary actions of the six extraocular muscles. 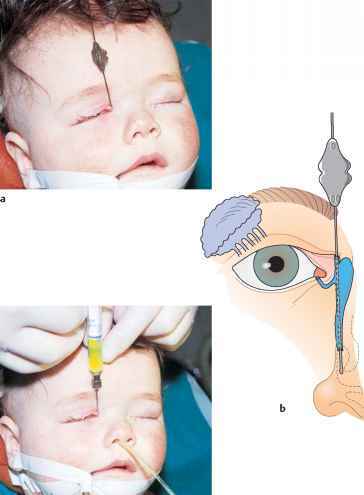 A knowledge of these actions is important to understanding paralytic strabismus. Nerve supply to the extraocular muscles: The oculomotor nerve (third cranial nerve) supplies all of the extraocular muscles except the superior oblique, which is supplied by the trochlear or fourth cranial nerve, and the lateral rectus, which is supplied by the abducent or sixth cranial nerve (see Table 17.1). The extraocular muscle nuclei are located in the brain stem on the floor of the fourth ventricle and are interconnected via the medial longitudinal fasciculus, a nerve fiber bundle connecting the extraocular muscles, neck muscles, and vestibular nuclei for coordinated movements of the head and globe (Fig. 17.2). Various visual areas in the brain control eye and gaze movements. The location of the muscle nuclei and knowledge of the visual areas are important primarily in gaze paralysis and paralytic strabismus and of particular interest to the neurologist. For example, the type of gaze paralysis will allow one to deduce the approximate location of the lesion in the brain. 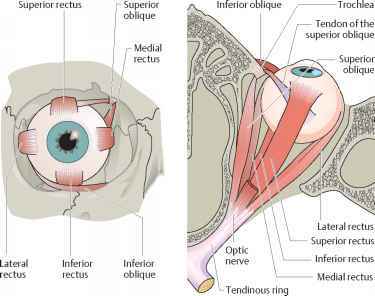 H All extraocular muscles except for the superior oblique and lateral rectus are supplied by the oculomotor nerve. Physiology of binocular vision: Strictly speaking, we "see" with our brain. The eyes are merely the organs of sensory reception. Their images are stored by coding the stimuli received by the retina. The optic nerve and visual pathway transmit this information in coded form to the visual cortex. The sensory system produces a retinal image and transmits this image to the higher-order centers. The motor system aids in this process by directing both eyes at the object so that the same image is produced on each retina. The brain can then process this information into binocular visual impression. A person has no subjective awareness of this interplay between sensory and motor systems. — Location of the extraocular muscle nuclei and gaze centers. Fig. 17.2 The oculomotor or third cranial nerve supplies all of the extraocular muscles except the superior oblique (supplied by the trochlear or fourth cranial nerve) and the lateral rectus (supplied by the abducent or sixth cranial nerve). 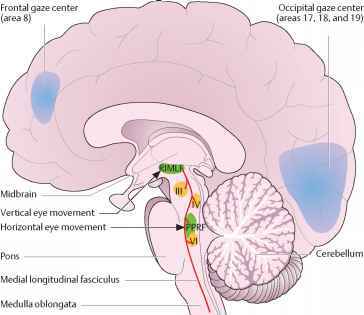 The rostral interstitial nucleus of the medial longitudinal fasciculus (RIMLF) is responsible for vertical eye movement and phases of rapid nystagmus. The paramedian pontine reticular formation (PPRF) is responsible for horizontal eye movement. object always lands on identical areas of the retina, referred to as corresponding points on the retina. Objects lying on an imaginary circle known as the geometric horopter (Fig. 17.3a) are projected to these points on the retina. A different horopter will apply for any given fixation distance. The images of both retinas are therefore identical in normal binocular vision. This phenomenon may be examined by presenting different images to each retina; normally both images will be perceived. This is known as physiologic diplopia. H Physiologic diplopia can be demonstrated by placing two vertical pencils in a line along the subject's visual axis, with the second pencil approximately twice as far from the subject as the first. When the subject focuses on one pencil, the other will appear double. 2. Fusion: Only where both retinas convey the same visual impression, i.e., transmit identical images to the brain, will the two retinal images blend into a single perception. Impaired fusion can result in double vision (horror fusionis or diplopia). — Geometric and physiologic horopters. Fig. 17.3 a Geometric horopter. The light rays from the fixation point strike the fovea centralis in both eyes in normal simultaneous vision. 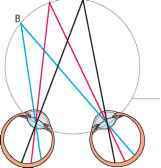 Therefore, objects A and B on the geometric horopter are projected to corresponding points on the retina. b Physiologic horopter. In a narrow range in front of and behind the horopter (Panum's area), two retinal images can still be fused into one. Points A and B, which lie outside Panum's area, are projected to noncorresponding points on the retina. 3. Stereoscopic vision (perception of depth): This is the highest level of quality of binocular vision and is possible only where several conditions are met. For objects to be projected to corresponding or identical points on the retina, they must lie on the same geometric horopter. Objects lying in front of or behind this circle will not be projected to corresponding points but to noncorresponding or disparate points on the retina. The result is that these objects are perceived as double images (diplopia). However, objects within a narrow range in front of and behind the horopter are fused into a single image. This area is referred to as Panum's area. The brain processes noncorresponding retinal images within Panum's area into a single three-dimensional visual perception and does not interpret them as double images (Fig. 17.3b). On the contrary, the brain uses the double images to distinguish differences in depth. WHAT IS VISUAL ACUITY AND WHAT IS THE EFFECT OF RECTUS MUSCLE ON VISUAL ACUITY?